This page is a simple directory of all battle reports I write for my local gaming club’s Warhammer 40,000 campaign. They will follow the progress of the Chaos army of the Great General of the Darkness and his lieutenants Acheron and Ju’zan. PROLOGUE – The History of the Mykene Legion, Including the Bardos Incident! Begin reading here to learn of the army that waged war upon a benighted corner of Imperial space, that fought piratical Orks, hideous alien hordes, noble Astartes and insane Necrons! Continue to find out about their unlikely allies! Thanks to a sadly anonymous online artist who stepped up to the challenge of drawing my army’s leader! THE GREAT GENERAL OF THE DARKNESS: A Demon Prince, whose Forge Mace can liquefy entire squads of the most stern warriors with a single blow. JU’ZAN THE INFERNAL (Deceased): Former Lord of the Mykene Legion, whose broken body is now merged with a wrecked Hellbrute to form the Great General’s corporial shell. ACHERON (Deceased? 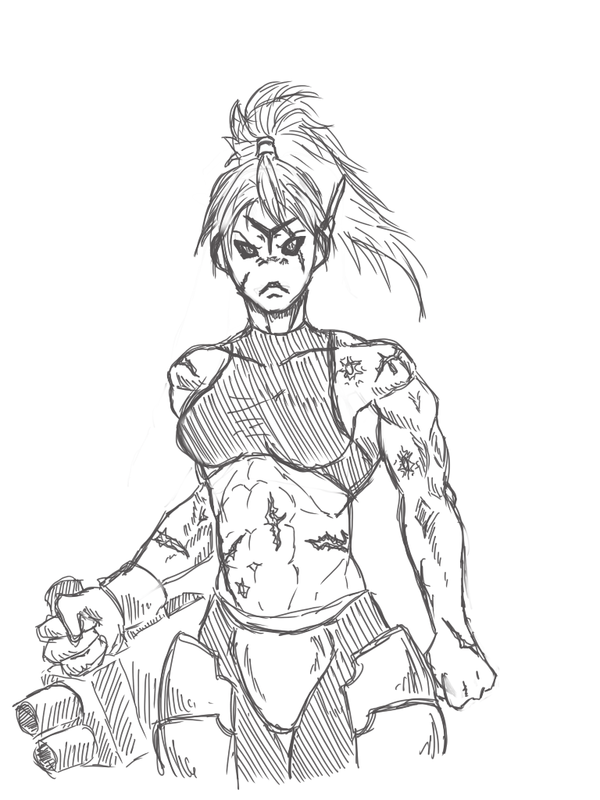 ): Ju’zan’s second-in-command and chief lackey of the Great General. Rarely fights in person. Leader of the Cult of Bardos. Apparently killed by Capitan Roderigo Pelayo of the Crimson Fists. THE APOSTATE VOGLER: A delegate of the Dark Mechanicus. Mentor to the impetuous and now understandably deceased Kenzan. Leader of the Cult of the Great Fire. ALBERO OF THE CRUSHING BLOW: The new de facto leader of the Legion’s armies following Ju’zan’s ascension. Currently resident in the Fortress Budo, supervising the construction of the Panopticon. Shas’O Ru’luc: Commander of the Tau Expeditionary Force, ace pilot and renowned war hero. Veteran of countless wars against Farsight’s rebellion, among others, and pilot of a heavily-modified XV9 Hazard Suit styled after his idol R’Alai’s own. Now serving the Great General of the Darkness under orders from the Water Caste. Por’O Eu’fea: Water Caste ambassador who made first contact with the Great General, believing him to be a representative of the Space Marines. Ignorant of the nature of Chaos, she was mind-controlled by Vogler via hypnotic suggestion and drugs, and has declared the Ru’luc Expedition as staunch allies of the Mykene Legion. 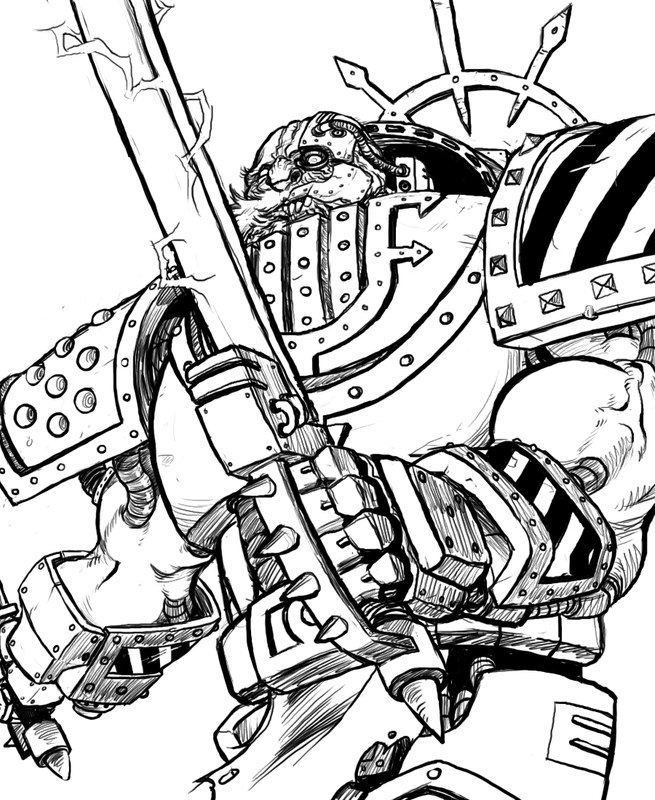 Shas’O R’in [DEMOTED to Shas’vre]: Ru’luc’s second in command, leader of the force sent to defeat Greenbeard the Ork. Won a decisive victory against Greenbeard in her first engagement with him thanks to the experimental Mei’Ou System, a powerful melee weapon for battlesuits. Shas’O O’Kita: Following Ru’luc’s displeasure with R’in’s hyper-aggressive combat style, O’Kita, or Commander Resurgence, was promoted as reward for his destruction of the Phaeron Isiset. Shi’vre Qan: Leader of the infantry contingent of R’in’s forces. A dedicated Ork hunter, and as such a perfect choice for the liberation of the desert world. Shas’vre Kai’la: Newly-promoted pilot of the first and only XV104 Riptide sent to Ru’luc. Received hitherto unheard-of multi-rank promotion for heroic actions saving the Riptide prototype from destruction when the supply base at Ha’Lios was attacked by Tyranids. WEEK ONE – Exciting Desert Battle! Enter the Great Greenbeard! In which the Spawn of Hell Castle, the Mykene Legion, make their debut, vowing to wreak a campaign of destruction across the sector! Thrill at their clash with the mad Ork Greenbeard! Wonder as a monstrous Demon Engine faces down fearsome Gretchin! Marvel as the Ork fighter ace Maverick takes to the skies! WEEK TWO – The Secret Mission! Hidden Base on the Ice Planet! In which, fearing the closing forces of the Inquisition, the Mykene flee to the apparent safety of a blasted tundra! Plans to fight the elusive Eldar melt away as evil Necrons claw their way up from the ice! The horrific mechanical dragon Dracodeus XIV takes flight! How can the Mykene Legion’s elite Iron Mask Corps fight a foe who won’t die? All this and more in episode 2! WEEK THREE – Space Marine vs Space Marine! The True Evil of Hell Castle!! In which the Black Templars attack Hell Castle itself! The Order Cuillerian seek to outdo the Grey Knights in fighting demons, but their arrogance may prove their doom! Three Mechanical Beasts fight legions of loyal Space Marines! Ju’zan the Infernal unleashes the power of Slaanesh! Episode 3, the most exciting yet! WEEK FOUR – Hot-Blooded Counter-Attack! Arrival of the Crimson Fists! In which, sorely vexed at the defeat of fellow Sons of Dorn, Capitan De Rada of the Crimson Fists leads an expedition to avenge them! Three Chapters of Space Marines have to work together to fight The Great General of Darkness himself! Mechanical Beasts once again bring fire to the tundra! Episode 4, a high-stakes battle for the honour of the Astartes! WEEK FIVE – Counter-Attack of the Necrons! The Decisive Secret Weapon? In which the ancient Necron mastermind Xanith rises from the depths of the tomb complex to continue his campaign of conquest, put on ice for centuries! Devastating superweapons of a lost age of technology – a black and cruel history of war – are unearthed, and Hell Castle’s forces once again face an undying, inscrutable foe. Episode 5 of THE WAR OF THE WORLDS, don’t miss it! WEEK SIX – Icebound Fortress Budo! Battle for the Fate of a Planet! In which a new member of the Legion’s forces, Albero of the Crushing Blow, is pitted in deadly battle against the Ork hordes of Zagboink as he hunts down a relic which will give the Mykene an iron grip on their icy home. As ancient battlefields ring again to new bloodshed, who will emerge victorious in Episode 6 of THE WAR OF THE WORLDS?! WEEK SEVEN – Coming of The Beautiful Night! The Panopticon Opens! In which, left in control of the fortress Budo, Albero and Vogler begin their own testament to the glory of the Great General, constructing the devilish Panopticon of Vogler – a superweapon which can affect the future itself! The test-firing of this arcane mechanism attracts the ire of Ahriman himself! Servants of Tzeentch fight to keep order against the the Mykene’s leaders in Episode 7 of THE WAR OF THE WORLDS! WEEK EIGHT – The Great General is Reborn! In which Field Marshal Blitz sends the Emperor’s Boot against the newly-reborn Great General of the Darkness! As the Mykene Legion return to the desert planet where they once were defeated by Greenbeard, new forces have emerged and the mad Ork is long-gone! But as the smoke clears on the battlefield and the demon’s reign of terror begins again, a strange message from the greenskin horde echoes out across the wartorn sector! WEEK NINE – Tragedy of Krieg! Death Korps versus the Mykene! In which Field Marshal Blitz again moves on the Mykene! Major-General Sturm is ordered to begin the siege of Acheron’s forward base, and the Mykene counter-attack in force to attack a vital gun battery! Tragic personal stories, brutal warfare in the grim darkness of the far future, and more! WEEK TEN – The Great Mechanical Beast Army Strikes! In which the Apostate Vogler deceives the Tau ambassador Eu’fea and her brother the warlord Ru’luc! Find out how steely Chaos Space Marines capitalise on the new upstart Tau Empire and turn their superior firepower on the Ultramarines! A wall of implacable machines stride forward with dread purpose! WEEK ELEVEN – Operation Reconquista! Return of the Crimson Fists! In which the Sons of Dorn, now under the leadership of Capitan Pelayo, aim to crush Acheron’s ambitions – and come close to succeeding! Watch the mighty sorcerer of Chaos crushed by Imperial forces! See Tau allies, mindless slaves to darkness now, bring cold clinical war-robots to bear on noble Space Marines! A battle of truly epic proportions! WEEK TWELVE – Greenbeard Versus the Tau! In which the great Ork Warboss Greenbeard tries to take on the Great General’s Tau mercenaries and realises they are not to be trifled with! Shas’O Ri’n tests the devastating Mei’ou System, a secret weapon of immeasurable power! Will The Sorcerer Gehennam be the one to bring an end to Greenbeard’s reign of terror? Will the Green Baron save the day? WEEK THIRTEEN [Side Story Chapter] – The First Launch! Its Name Is Riptide! In which, taking a slight diversion from the story of the Mykene, we visit a remote Tau colony beset by Tyranids. A Fire Warrior tasked with protecting a shipment from the Earth Caste finds himself at the controls of an experimental battlesuit, the XV104 Riptide, and he is all that stands between the colony of Ha’Lios and its destruction! WEEK FOURTEEN – The Horror of Hive Fleet Inferno! In which an elaborate scheme from the insane mind of Vogler goes awry! Tyranids scythe through Chaos lines in a bloody, grotesque battle of implacable alien against emotionless machine! What begins as a cunning Chaos trap sees the tables turned as the Swarmlord meets it head on and emerges victorious! WEEK FIFTEEN – Emergence of a New Threat! Operation Twisted Manta! In which Commander Firebrand, thinking a weak Ork base is an opportunity to train infiltration teams, discovers the new horrors unleashed by Greenbeard’s rampage within an underground temple! The most horrific enemy to date engages the Tau in a desperate last stand in the swirling sandstorm! WEEK SIXTEEN – R’in’s Counterattack – Operation Tomb Slayers! In which, humiliated by the Devourer and its Necron underlings, Commander Firebrand launches a suicidal attack on a Necron tomb! Isiset, Queen of Ruin, rises to defend ancient halls! Frantic room-to-room combat in the ink-dark labyrinth of an underground structure proves an almost insurmountable challenge for the Tau! WEEK SEVENTEEN – Dark Angels Attack! Operation Resurgence! In which Sammael, Master of the Ravenwing, launches a daring raid on Tau fortifications in an old fuelling-station, intent on taking prisoners to discern the location of the Fallen! The unpopular O’Kita is forced into combat on unfriendly terms as the enemy fall upon him at lightning-speed! WEEK EIGHTEEN – Hekaton’s Folly! Ru’luc Versus the Mind Tearers! In which the Mind Tearers of Captain Hekaton are driven into battle as Sunset himself tries to recover a missing piece of Tau technology! A carefully planned ambush turns into a furious firefight as the Space Marines are divided and fight to regroup! WEEK NINETEEN – The Tide of Filth! Summoning of the Demon Yersinia! In which the Tau become pawns in a fight between dark gods! Incomprehensible beasts are summoned by human depravity and a desperate battle ensues. Superior firepower and supernatural guidance faces implacable, resilient monsters from the Eye of Terror! In which we leave the 41st millennium and turn to another war. The year is 1904. American warships patrol East Asia on the hunt for a Japanese battlegroup. Battle is joined in the volcanic Spratley Atoll between the notorious Sayako Hirogawa and her American rival, the obsessed Ruben Hawkins. BONUS FEATURE ADDED: Newspaper clipping from after the battle. WEEK TWENTY-ONE – The Desperate Mission! Battle of the Four-Dimensional Rift! In which Commander Sunset launches an all-out attack on the source of the demonic incursions, and meets the Death Guard of Lord Dredge! Failure here will doom the world to an all-encompassing time of demons, but the Tau seem outmatched and outnumbered! Raw courage is all that separates man from beast, and the planet from total annihilation! I don’t know for sure (I don’t think anyone plays LoTR at the club) but if you look us up on Facebook the guys who run it will set you straight with a definitive answer.